A good filtration system will ensure high Koi pond water quality. You Koi pond must be kept clean at all times. Keeping your Koi pond clean should be a task you need to complete daily. If you do not keep your pond clean, your Koi will live in a stressful environment and could possibly die. Remember the water is not only the place Koi live, but they sleep, eat, and use the bathroom here as well. Keeping the pond free of harmful contaminants must be a top priority if you are going to have a water garden. Start with the water it should be crystal clear. If you cannot see the bottom of your pond, it is dirty and should be cleaned immediately. Remember Koi will eat whatever is in their home “the pond” so make sure trash and debris is clean out every day. You have spent countless hours building your pond, choosing plants, and landscaping the garden, so don’t ruin its beauty by allowing the pond to become an eye sore. If you do not keep the pond clean, the fish will suffer. Your beautiful fish will suffer not only with health issues but their color will dull. Treating your Koi pond like an outside fish tank will insure that the pond stays clean and is a place where everyone likes to visit. First, make a plan on how you will clean your tank. You must have a filtration system. This system will ensure that your water is of high quality by continually moving the water through a pump and collecting debris in the filter. Koi tend to eat more food in captivity than in nature. Be aware of how much food you are providing each week, because the more food the more waste you will have to deal with in the pond. Remember the waste is not just from the fish but also from the uneaten food that settles to the bottom of the water garden. It is important to vacuum the bottom of your pond, clear the drain, and pump system. This will keep your water clean and healthy for the fish. Because your pond is outdoors, you will encounter another set of problems. Debris from trees, trash, and grass will find its way into the pond. You will also need a skimmer to keep the debris from sinking to the bottom and clogging drains and filters. Do not take the cleaning of your water garden for granted or you run the risk of harming your fish. 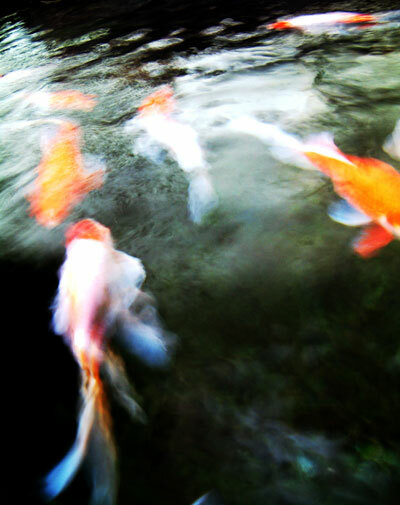 Your Koi’s health can be greatly influenced by any debris and pollution in the water. If the pond is not kept clean you are at minimal going to stress your fish, possible make them more susceptible to disease and potentially kill the Koi. Water in the pond must be kept moving. First, movement of the water helps the water quality. Next, the stirring of water keeps the pond appropriately oxygenated. Keep the water moving in your garden pond by adding fountains, waterfalls, or pumps. Keeping your pond clean can also be achieved by keeping a low number of fish in your pond. Remember unless you keep males and females apart you will end up with babies, meaning a lot more waste and dirtier ponds. Take measures each week by vacuuming the bottom of the pond, skimming the top of the pond, and keeping the fish count low in order to provide your fish with a high quality living environment.